Which one is the best for my website? This is one of the biggest dilemmas we all have after we decide to create a website. Not all domain name extensions are equal. Some are popular while some others sound spammy. There are also domain name extensions that are relevant for only a particular country or sector. It also has a huge impact on the visibility of your website on search engines. Therefore, choosing the right domain name extension is as important as choosing the right domain name. In this article, we look into the most popular domain name extension, their benefits and who should use them. When You Should Use .COM? Originally, .com domain name is meant for commercial entities. If you are building a website, .com is a great option. It is the oldest and most recognizable domain name which makes it a popular option. Currently, more than 40% of the domain names registered are .com domain names. You should choose the .com if you are concerned about the branding. A .com domain name is considered more authentic than other generic top-level domain names like .net or .info. Brandability: Generally, .COM is considered as more authoritative. Among www.yourbrandname.com and www.yourbrandname.net (or anything else), .com version is regarded as genuine. International Relevance: .COM is more relevant than country code domain names like .uk, ,ca and .in if the website targets international market. Moreover, websites with country code domain names would have a hard time to rank better in other countries when it comes to the SEO. Many people rely on other generic top-level domain names like .NET, .INFO, .XYZ, .BIZ, etc. if the .com is not available. This is a bad choice, especially if it is for a business. It will make people think that your company is not genuine and it will affect your brand negatively. Some businesses may want to use domain names other than .COM. For example, the .io is a domain name which is very popular among the tech companies. Even if you do so, you should also buy .COM domain name and keep it in your control. You shouldn’t let anyone else use the .com domain with your business/brand name. The country code domain names are meant for entities associated with a particular country. Here is a list of some of the most popular examples. You can also have second level domain names under the top level country specific domains. For example, the .UK is a country code is a top level domain. It has the following second level domain names under that. In most cases, it is recommended to avoid the second level domain names like these. SEO Boost for Specific Country: Websites with CCTLD is a ranking factor. It helps websites to rank better for country-specific searches in the search engines. If you are a local business, or operate only in one country, having a ccTLD will help you rank better in that country. Easy to get the desired name: Compared to .COM domain, it will be easier to get the desired website name if you choose CCTLDs. Instill Credibility: A study in the UK showed that people believe .CO.UK is more authoritative than .COM websites. However, this attitude may vary from country to country. CCTLD is less brandable compared to .COM. It is harder to rank for searches from other countries. Can I Use .IO Domain? The .IO domain name is originally meant for British Indian Ocean Territory. However, many people in the tech industry consider that the .io stands for input and output and so it is relevant for tech companies. Currently, most search engines consider .IO as a generic domain name, so it is ok to use it for any website. These all are the essential things you need to know before you choosing the domain name for your website. 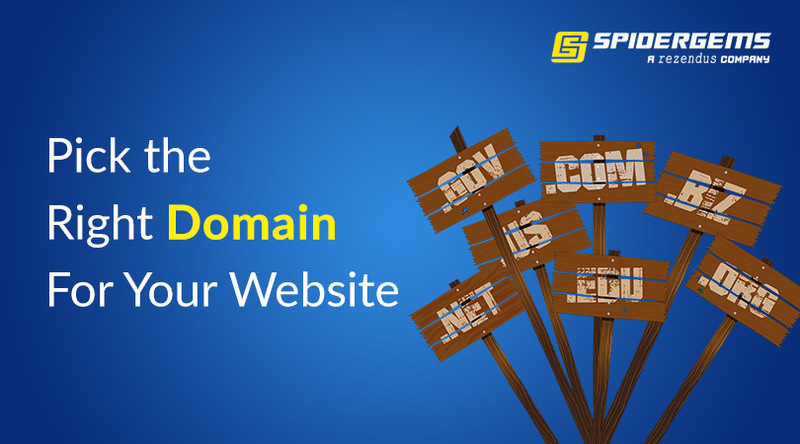 We hope this will help you to make a better decision when you buy the domain name for your website.